Pegasus, the UK’s leading independent health communications consultancy, picked up the “Specialist Consultancy of the Year” award at the PRCA Awards 2014.
Pegasus was also successful in scooping the “Health & Wellbeing” award for their work for Bayer Animal Health on the Slimewatch campaign, making it the campaign’s eighth award this year. With campaigns that span local, national and international markets and the creation of a network of global independent affiliate agencies across five continents, it’s no surprise that Pegasus represents a raft of well known companies and brands such as; GSK, Pfizer, Bayer, Holland & Barrett, Bio-Oil and Danone to name a few. 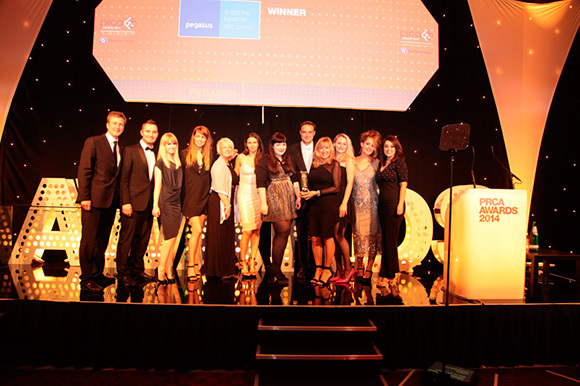 These awards are further confirmation that the consultancy continues to go from strength to strength, creating outstanding integrated campaigns that really bring healthcare into the mainstream. This is the fourth consultancy award win for the agency this year. It has seen five years of double-digit growth, with last year’s fee income of £6m helping it climb ten places in this year’s PR Week Top 150 PR Consultancies report to No. 38.